I’ve already looked at this Cape Cutter 19,* but that was in September, 2011. 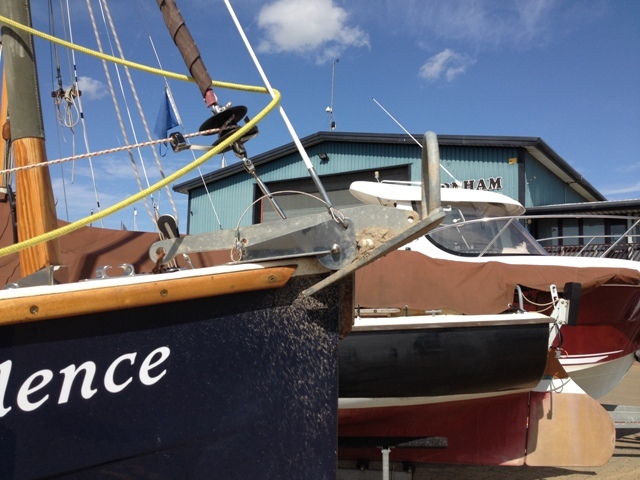 Here she is again in the same spot at Burnham Yacht Harbour. She still looks good, as can be seen from the photographs. I should have gone for a sail today. 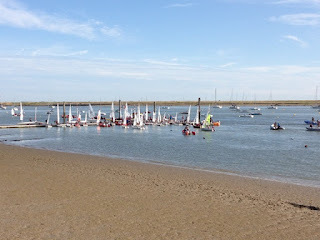 Instead, after taking my wife to a garden centre, I went to Burnham for a walk by the river to see activities associated with Burnham Week. This always starts on August Bank Holiday Saturday. 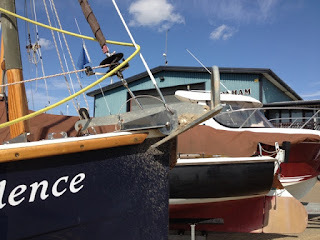 As usual, when visiting Burnham, I took a look at boats for sale at Clark and Carter. However, this fin keel Freedom 21 doesn’t look as if she is for sale, as I didn’t see a notice to that effect attached to her hull, and I couldn’t find her on the C & C ‘Yachts for Sale’ list. 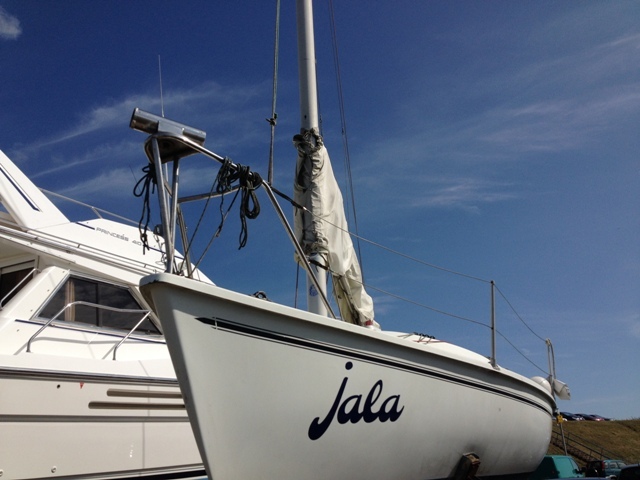 Freedom 21 sailboats were first built in the US in 1982. 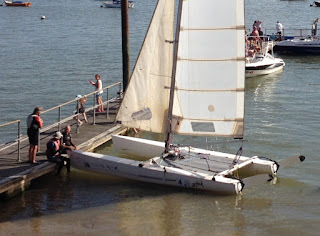 Designed by Garry Hoyt, they were rigged with an un-stayed flexible mast and a fully battened mainsail; plus a unique spinnaker system invented by Garry. He calls it the Hoyt Gun Mount. 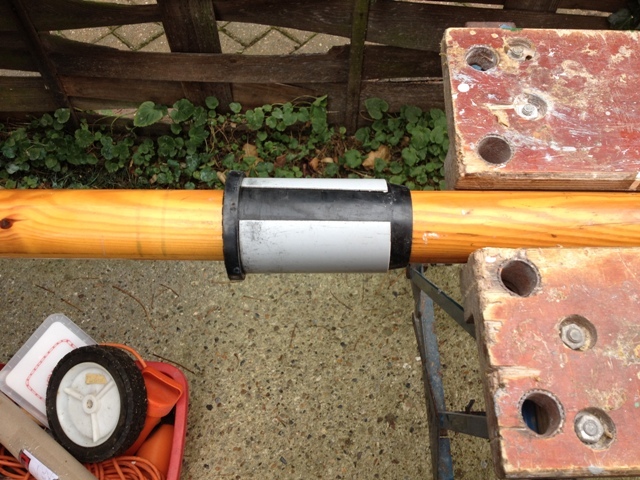 It consists of a spinnaker pole that passes through a tube mounted on a spindle attached to the pulpit. The pole can be shunted to and fro when changing tack. 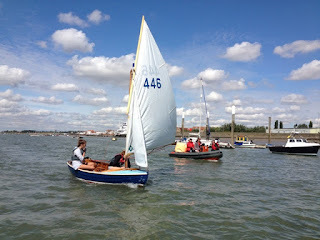 The spinnaker is easily hoisted and taken in by a solo sailor. 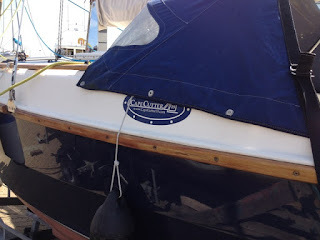 He can hoist it with a halyard and lower it into a ‘sock’ by means of a downhaul. (See Freedom 21 Demo Video: https://www.youtube.com/watch?v=Mx7bMnQgRoY) This cat rig has the advantage of ease of reefing as with a junk rig, but with the windward efficiency of a Bermudan rig. All control lines are led to the cockpit for speedy and safe handling without the crew having to go on deck. 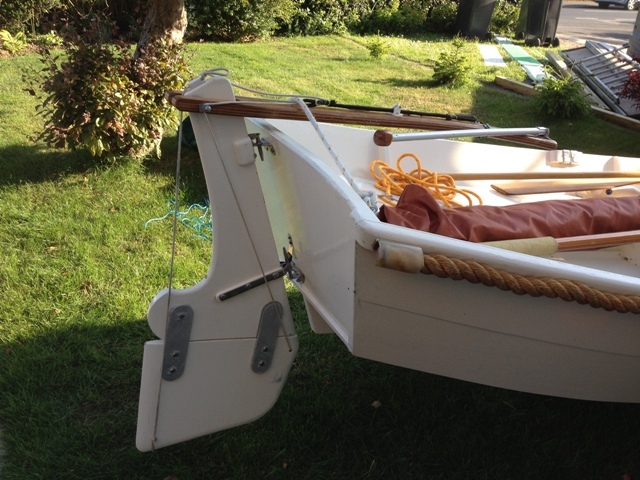 The boat featured here has a fin keel, but others have been built in the UK with retractable bilge keels. A few had Warwick Collins Tandem Wing Keels. Here’s a good PDF article by Wilfred Bishop with information about Freedom 21 keel types: http://www.freedom21.info/F21KeelOptions.pdf . On and off, I am still messing about with Pike, and as Rich_D said in his comment to Part 1, such activity ashore and afloat can bring ‘simple pleasures’. This is true. 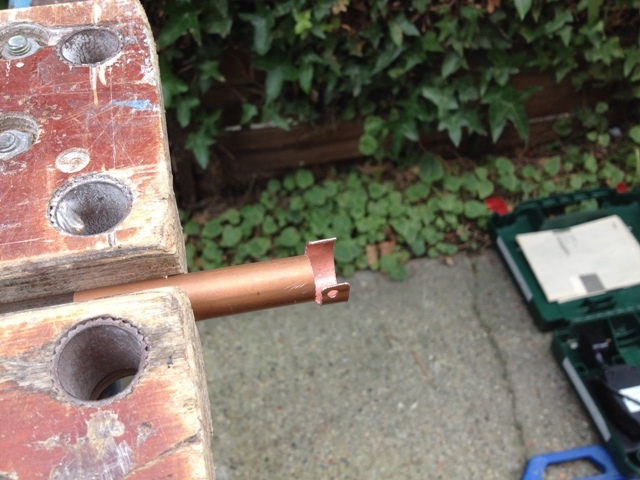 Yesterday I spent time making a copper fastening for retaining a section of rope fender that had come loose on the port side of the boat. 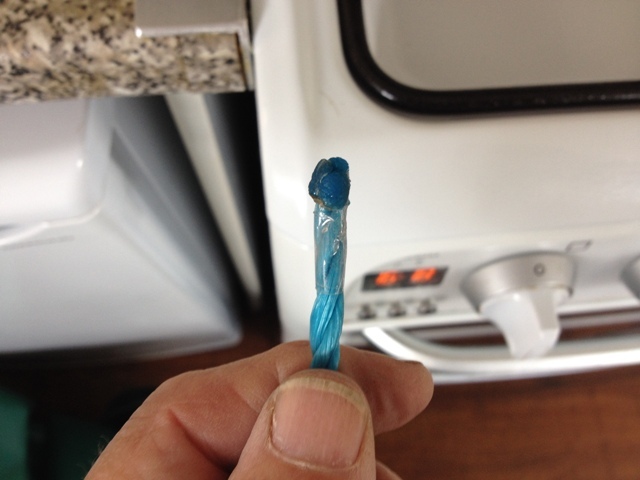 One of the old fittings had snapped, and it required replacing. 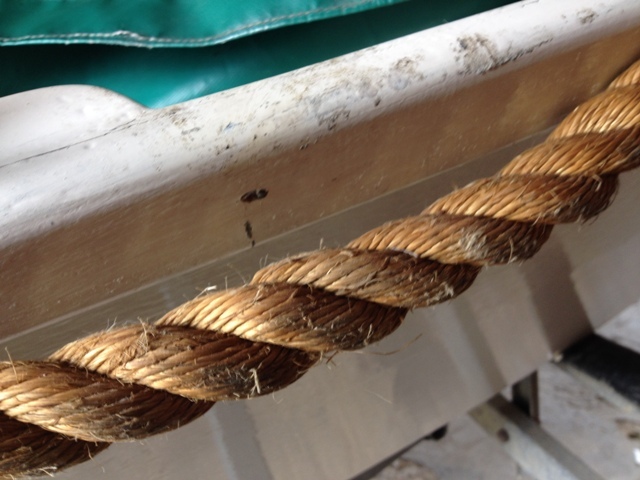 I’m not keen on rope fenders. 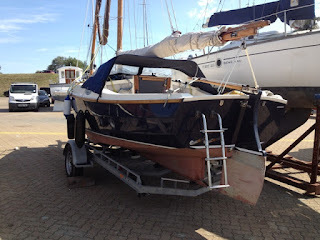 Pike’s look untidy, but they do the job of protecting her topsides. 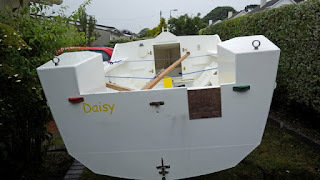 Just above where I did the repair - on the gunnel - the paint has been damaged by a pad made from adhesive carpet tape for preventing the trailer strop from biting into the gunnel. 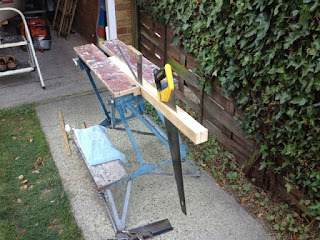 I’ve found a way of avoiding further damage by dispensing with the pad and placing the strop in the rowlocks. When I took Pike for a sail, and I came to row her, I noticed that pieces of plastic piping clipped to the sleeves to act as wear plates, rotated. To prevent this happening, I’ve fixed them to the sleeves with brass screws. Another thing that bothered me was the untidy ends of Polypropylene ropes used for securing Pike’s cover; therefore I cut and sealed their ends by exposing them to flames from a gas ring on the hob of a cooker in the kitchen. 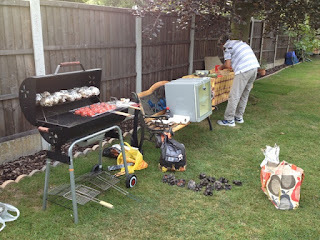 My wife was very restrained when I suggested I should use ‘her’ kitchen for such a smelly job. With windows open and the door wide open, I carefully went about the job so as to leave no trace behind of what had taken place. 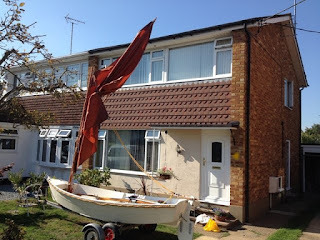 I recalled times when I had laminated spars and various parts of boats in the kitchen, the lounge and the hall, even the bedroom – always when my wife was absent. She would return, never knowing what had taken place. I am amazed at the amount of information that can be found on the Internet about certain boats. I saw this centre cockpit Transworld 41 at Hullbridge. She was on a slipway at the eastern end of Brandy Hole Reach on the River Crouch. By keying her name, Lady Rosemary, into Internet search engines I was able to find out quite a lot about her. She was designed by William Garden and she was built by the Transworld Boat Building Company in Taiwan, in 1978. She is a British Registered vessel of 17.26 tons. 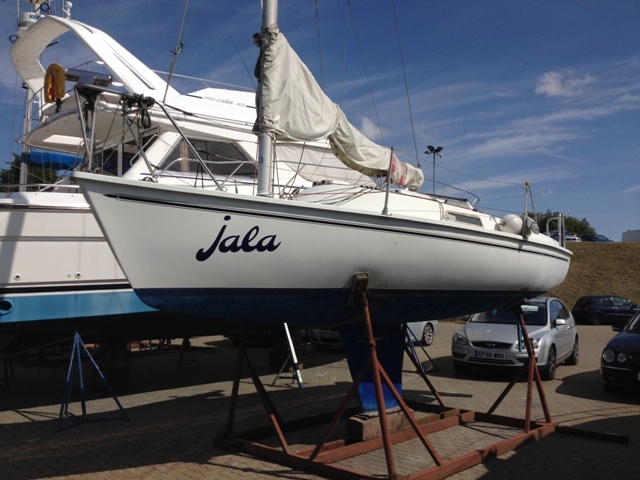 From Ancasta’s brokerage website* I discovered that the first owner had taken her on a world cruise. 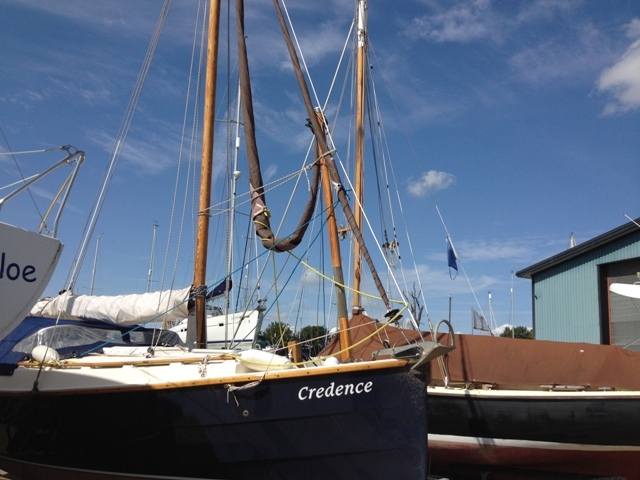 Her very comprehensive inventory at the time of sale included a Hydrovane self-steering unit and she was equipped with Seldon in-mast furling systems for both the main and mizzen. (This doesn't appear to be the case at the moment - see photos.) She was set up for single-handing, which for a globetrotter is a good thing, because crews are not always easy to find. On the other hand, she has seven berths distributed between three cabins. A bit of chartering wouldn’t be out of place. She is a bigger and far more complicated yacht than I would want to own, on account of numerous bits of equipment that could go wrong and the expense of running her, but she has already proven herself to be a practical live-aboard yacht with a few home comforts such as: a hot and cold pressurized water system, and heating in the form of an Eberspacher cabin unit. While looking for information about the boat, I could not avoid coming across details of the couple who currently live aboard Lady Rosemary. They are Jack and Anita Curtis. Anita set up a Blogspot blog** in 2008 telling of their life afloat. She makes and sells handmade jewellry, and she has a website illustrating her wares. 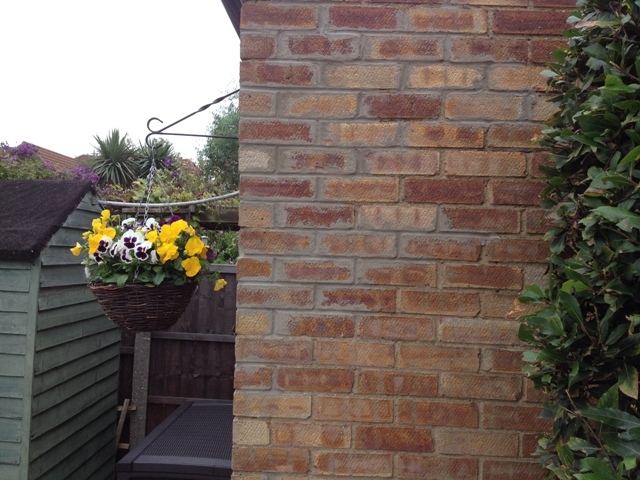 Here’s the address: http://www.anitacurtis.co.uk/ . This year’s Hurricane 5.9 Nationals were held at Thorpe Bay Yacht Club between 15th and 18th August. I took the above photo on 9th August. 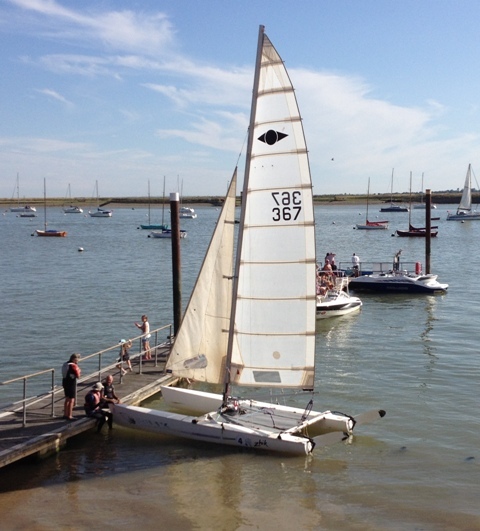 It features a Hurricane 5.9 catamaran at Burnham Sailing Club’s pontoon. This class of racing catamaran was designed and built by Reg White and his brother Robert, both of whom were Olympic sailors based at Brightlingsea Sailing Club. 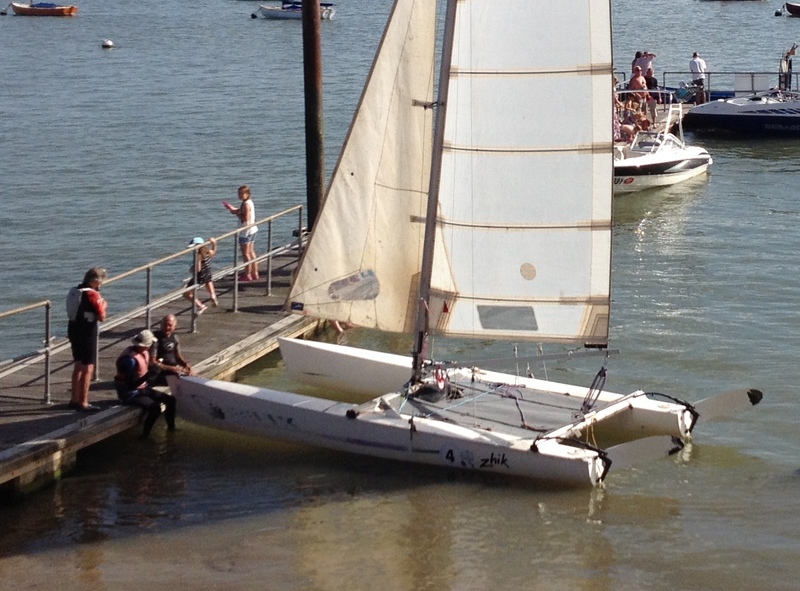 Reg helmed a Tornado Class catamaran at the 1976 Summer Olympics in Montreal. With his brother-in-law John Osborne as crew, he won four of six races to secure a gold medal for Great Britain. Tragically, he died of a heart attack after an evening race with his grandson on 27th May, 2010. These racing cats are admirably suited to places with shallow water, because they are equipped with kick-up centreboards and kick-up rudders. There is a fleet of five 5.9 SX catamarans at the Marconi Sailing Club which is situated on the south bank of the River Blackwater. 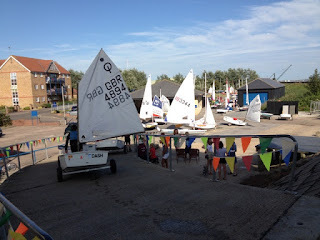 I was a member in 2007 and 2008 and I recollect seeing many catamarans at the boat park. 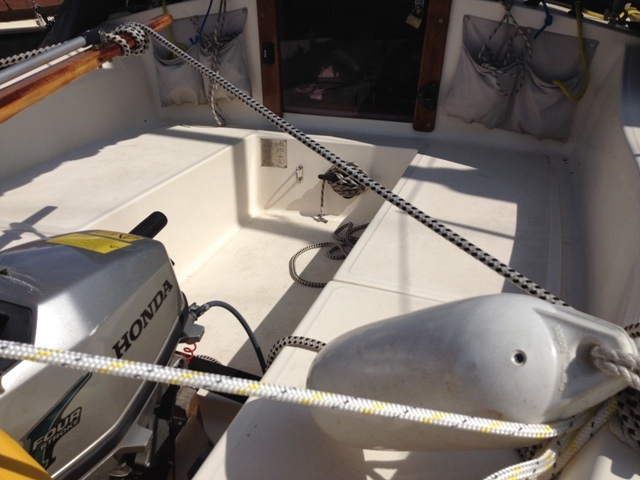 The experience helped me gain confidence for taking Pike for a sail**. 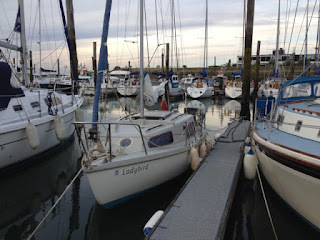 Since then I’ve had a two day cruise**** aboard Ladybird which has given me more confidence. Therefore I’m looking forward to another sail with Pike, but that won’t be until the weather cheers up, and conditions are right. From loss of confidence to looking forward is a big step in the right direction. Meanwhile, I’ve been messing about with Pike on dry land doing maintenance and modifications. A tiller extension is not required - Note the rope horse. Tiller extension in stowed position - Note the lashing to secure it. Ugh! 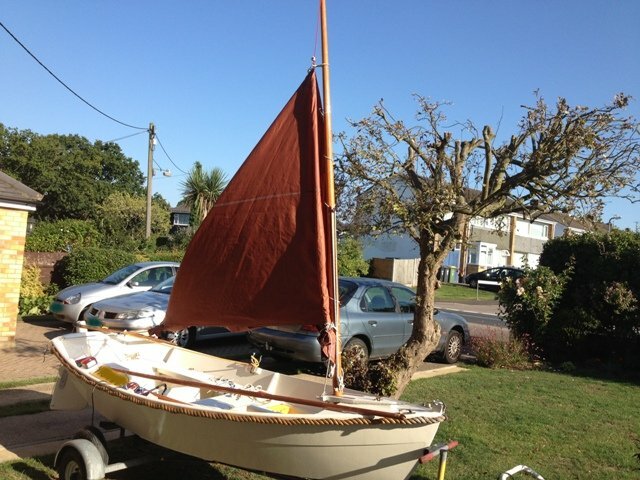 Quite a few changes to the original Iain Oughtred design were made to Pike by previous owners. The rudder was modified by having a fairly unique system for raising the lower half. This entailed having an up-haul and a downhaul, both of them running along the upper surface of the tiller. 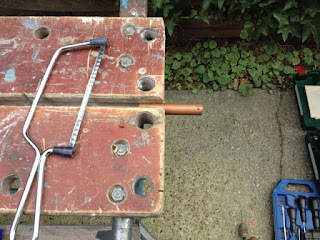 Each had independent hooks for retaining them when under tension. Above them there was a tiller extension. These additions did not feature in the original design. When I sailed the skiff for the very first time I found that there was no need for an extension, because the tiller could be reached when I was sitting on the side benches and on the thwart. Furthermore, the sheet sometimes became trapped under the end of the extension. Another added item not featured in the original design was a rope horse for a sheet block. When there was no tension on the block it often came into contact with the tiller and the extension. Instead of a rope horse there should be a continuous* sheet running from the clew of the sail through single blocks either side of the transom. The sheet should be long enough for the sail to be brailed to the mast. I am currently making these changes. There are a few more things I would like to attend to before my next sail. 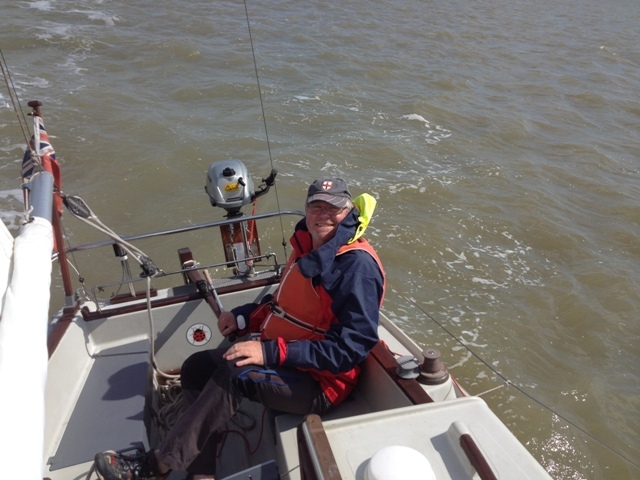 A planned short coastal cruise may not be straightforward on account of the weather. Would there be enough wind? Would there be too much? 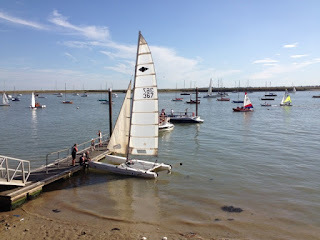 Would we be able to sail the boat back to Burnham according to the navigator’s plan? The 48 hour forecast at the start of the cruise predicted that the wind would be from a southerly direction between force 3 and 4. 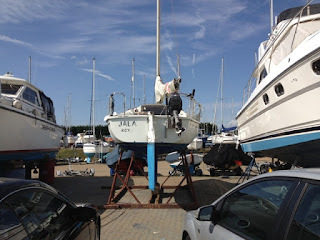 In which case, we would be on a reach for the first leg from Bradwell Marina to the Swin Spitway, and after tacking through the Spitway we could expect a long fetch with the wind coming from a point forward of the beam. In practice, that is how it nearly panned out, except we arrived a little too early at the Spitway. Instead of being there shortly before low water when the ebb would have been almost stationary, the tide was still ebbing into the Wallet. In order to make over the ground, we had to have help from the engine. At that point, just when we did not want the wind to head us, it did! 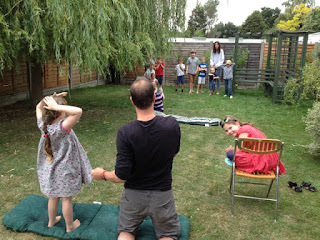 However, we were able to make 240 degrees while lee-bowing the ebb. 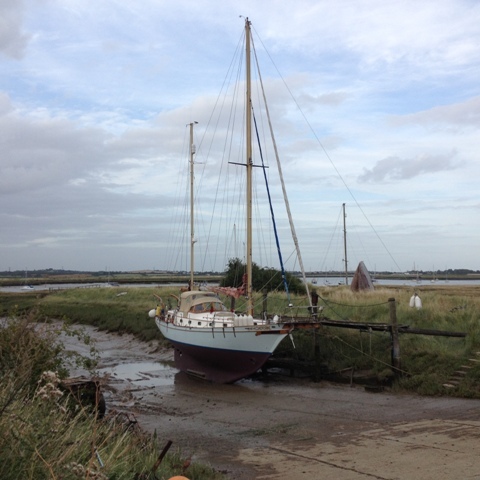 There are two passages between the Buxey Sand to the north and Foulness Sand to the south. We chose the northerly one marked by Swallowtial port hand buoys. The alternative passage was through the Whitaker Channel, but had we taken that option, the tide and wind would have swept us away from Burnham. The better tack was with the wind coming from the port hand side. At the outset, on leaving Bradwell Marina, the sky was grey, and there was fine drizzle, which was not at all inviting. No wonder only two other yachts were under sail, each of them considerably larger than Ladybird, and as usual, the larger ones sailed faster. For us that was helpful, because we could see where they were heading which was in the direction we wanted to go, i.e., towards the starboard hand Bench Head buoy. From there we would continue to the N W Knoll buoy and the Eagle before arriving at the Spitway. The sky began to clear, revealing bright blue openings between clouds to the SW. The wind increased to about a force three. 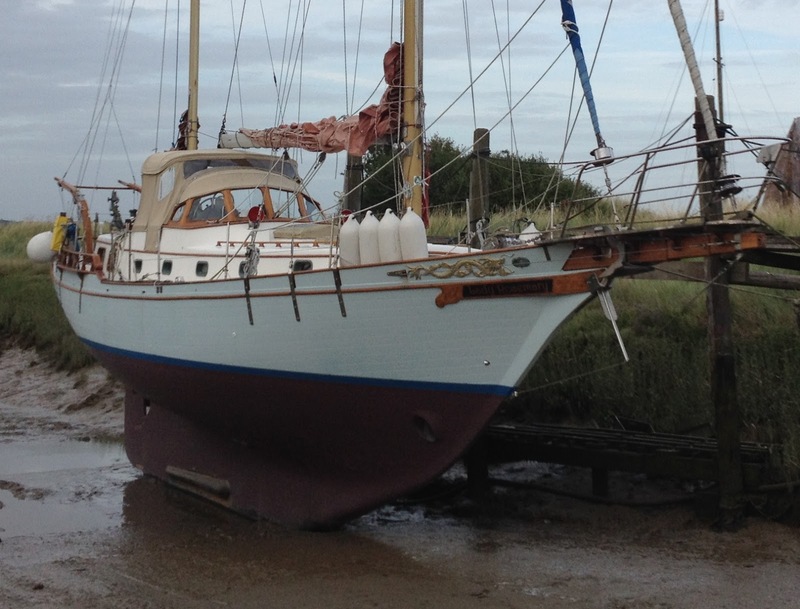 Instead of sailing at two knots, the yacht was doing over four. 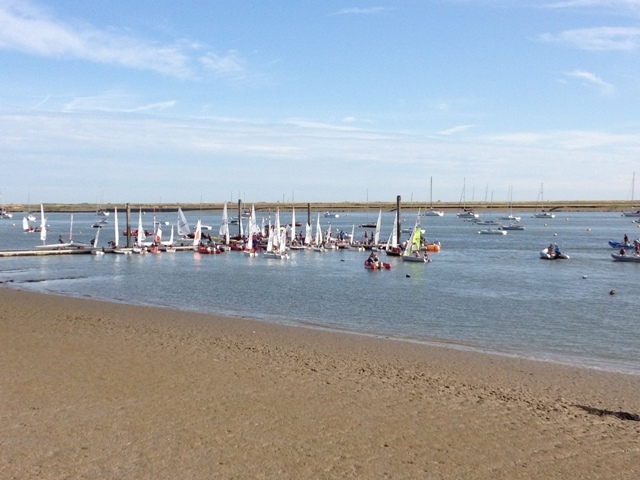 We should have reduced sail to slow us down, for arriving at the Spitway as planned at 09.45 – just before low water. Low water at Burnham was at 1016, but out at the Spitway it was earlier. The further north you go on the North Sea, the earlier high water is. That’s because the flow or flood travels from north to south, and consequently the ebb moves in the opposite direction earlier than in the south. The advantage of sailing at neaps is having deeper water at low water than at springs, because the range of water between high and low is less. For us, this was helpful because sailing on a south-westerly heading we could avoid the ebb by creeping over the shallows in the vicinity of the Swallowtail buoys. Beyond and in the Whitaker Channel, the flood made itself felt by lee bowing the yacht on both tacks – short when on starboard tack, and long on port. On approaching Foulness Sand, south of the Sunken Buxey shoal, we drew close to seals basking on the sandspit. 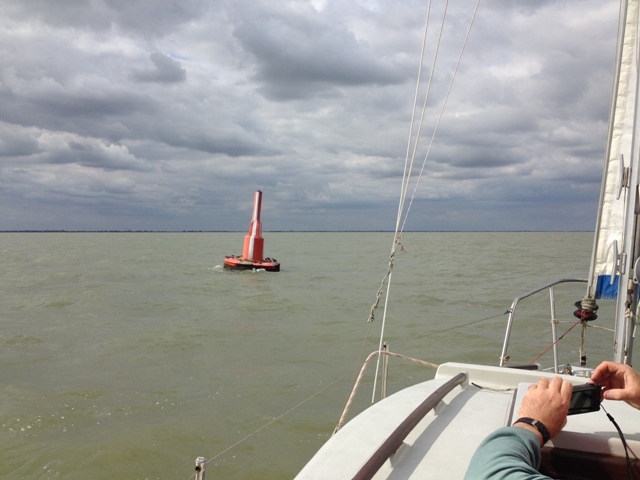 There you can sail very close to the sand in the proximity of Buxey No 1 buoy. Seals are not daft; they know were they can catch fish more easily -that’s where their prey have less room to pass between narrows; in this case, Sunken Buxey shoal to the north and Foulness Sand to the south. Here we came to the highlight of our cruise. Conditions couldn’t have been more perfect – smooth water, sunshine, beautiful cloud formations, sparking water, fresh air, and a perfectly trimmed boat. Ahead, lay our destination. Seven miles away, we would have to stop sailing, tidy the boat, pack our gear into the tender, and call it a day. We did not wish our time away. Instead, we wanted to continue. One thing I forgot to mention was the wonderful hospitality of the skipper. I never once had to prepare food or make a drink. He did it all! I was entirely spoiled and mollycoddled. Thank you, Captain for a great time. It was with a little trepidation that I stepped onto the platform at Burnham-on-Crouch railway station where I was to be greeted by the owner of yacht Ladybird. 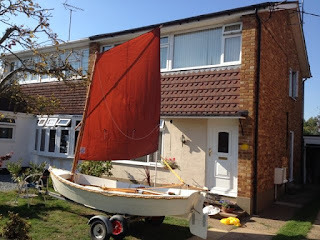 My trepidation was not to do with meeting him, but with facing the fact that I was going to start a short cruise involving more than would be required of a day sail with Pike, my Iain Oughtred skiff. 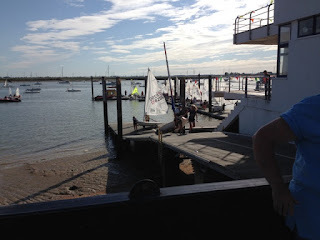 We would be leaving the River Crouch for a sail through the Ray Sand Channel, which would mean crossing the narrow isthmus of sand between Ray Sand and Buxey Sand. 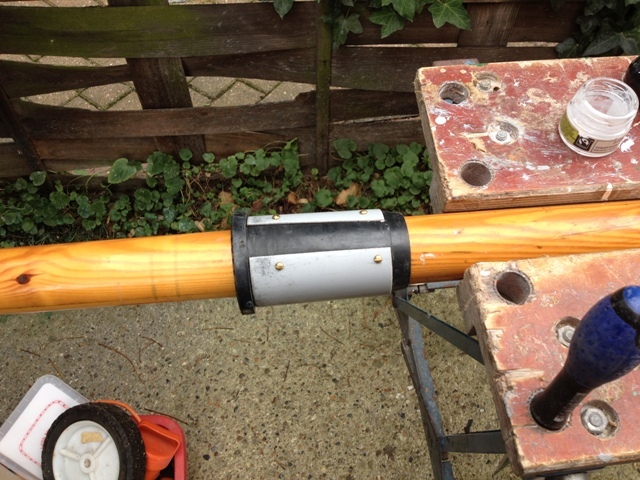 The return trip would be via the Swin Spitway at the eastern extremity of the Buxey Sand. The Met Office Inshore Shipping Forecast for Gibraltar Point to North Foreland was: ‘SW 3, occasional rain, fair later.’ In fact, the rain came later that night when we were snugly berthed at Bradwell Marina. It continued into the early morning of Thursday, 20thAugust. 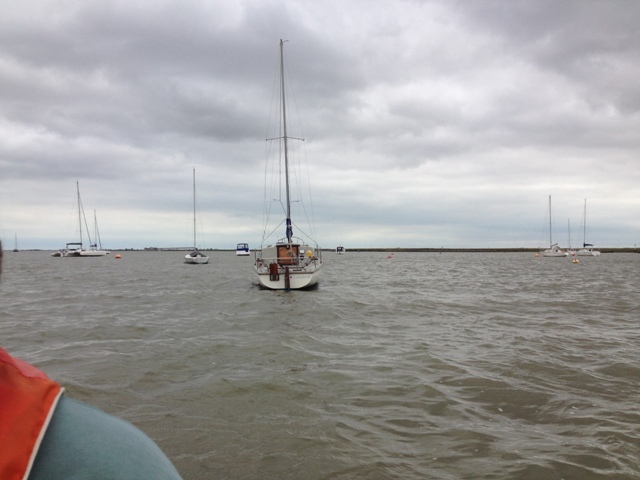 High Water for Burnham on Wednesday 19th was not until 15.49, which gave us ample time for getting to the yellow marker buoy from where we would sail northwards across the shallows for the Ray Sand Channel. At midday we cast off from Ladybird’s mooring at Rice and Cole and we powered clear of neighbouring boats before making sail. We anticipated that our crossing of the sand at the shallowest point would take place about an hour before HW Burnham. 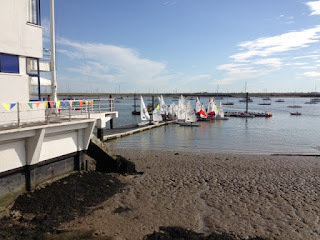 There were surprisingly few boats on the move, apart from a number of Burnham scows being sailed by youngsters. The Foulness Firing Range launch was anchored off Foulness Point and red flags were displayed on the south bank indicating that firing was taking place. We already new that because periodically, there were emissions of black smoke followed by the sounds of explosions. Rather than firing rounds, it appeared that the burning off of outdated explosives was taking place. A SW wind of force two gently wafted us over the incoming tide to give us two to two-and-a-half knots, bringing us to the all important yellow marker buoy. We arrived there a little later than planned, but that gave us the advantage of deeper water for crossing the hidden isthmus under Ladybird’s keels. We had an updated, detail chart showing two safe water buoys with vertical red and white stripes. Sure enough they were picked out by the skipper and confirmed to be so by further inspection through binoculars. They gave us reassurance that we were where we should have been. By then the wind was on ‘Ladybird’s’ port quarter and it increased in strength, possibly to a force three, giving us a good speed of over four knots. 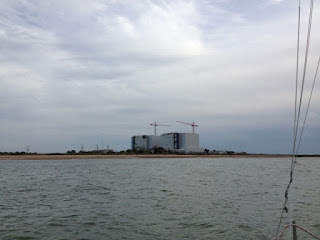 Far ahead to port there was the unmistakeable outline of Bradwell Power Station, which was very close to our planned destination at the marina. Our course was parallel to the eastern fringes of the low-lying Dengie Peninsular. Ladybird’s track matched the zero metre line on the chart, but with the depth sounder showing four metres, giving us three metres to spare. At the northern end of the Peninsula, beyond Tillingham Marshes, there’s the ancient landmark of St Peter’s Chapel. This historic building is a useful feature for taking compass bearings, and we used it for confirming our position in relation to Bachelor’s Spit, over which we passed with only a metre to spare - and that on a falling tide! To avoid the ebb from the Blackwater we sailed as close as we dare to Sales Point at the entrance of the river, but beyond that, and hard on the wind, the current forced us further and further into deeper and faster flowing water. 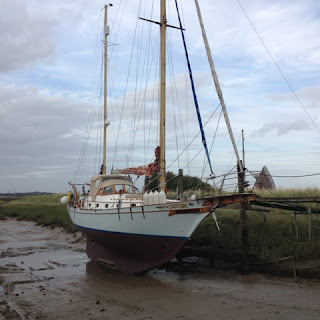 Had we not resorted to motor sailing we would have been forced to anchor until the tide or wind changed. 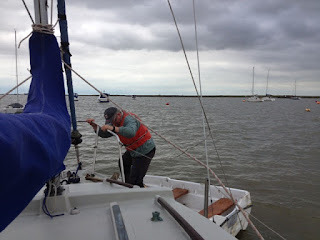 With only a mile to go, we furled the Genoa, started the engine and chugged into the wind, so as to arrive at Bradwell Marina in time for an evening meal. We walked a short distance to the Green Man pub where the skipper treated me to a deliciously tasty meal of fresh haddock and chips. As is customary for me on the first night of a cruise, I did not sleep well. I fitfully slumbered, periodically waking to listen to the pitter-patter of rain and to speculate about the next day. 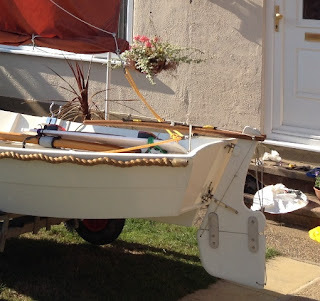 You’ll note that at the top of the homepage of this blog there is a photo of my old Roamer dinghy. She was designed by Eric Coleman, specifically for cruising. 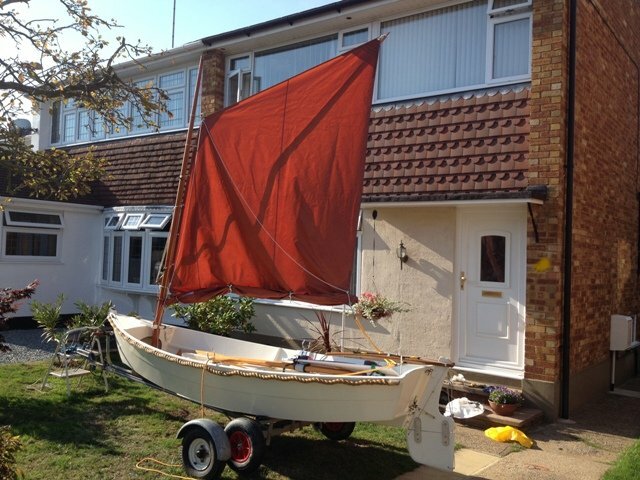 He was a founder member of the Dinghy Cruising Association (DCA). To learn more about Roamers, go to the links section at the bottom of this page. 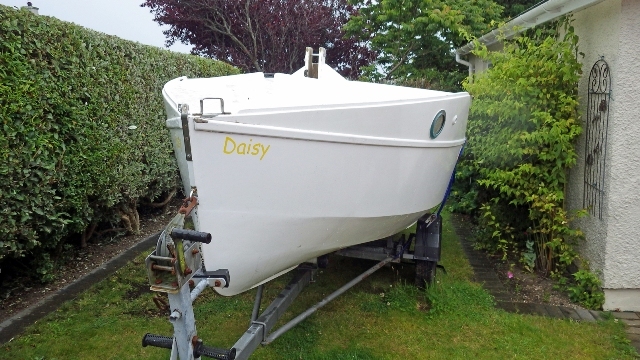 If you like what you see, and you want to get hold of a Roamer, why not respond to the advertisement below and ask to see ‘Daisy’ – but no time wasters please! 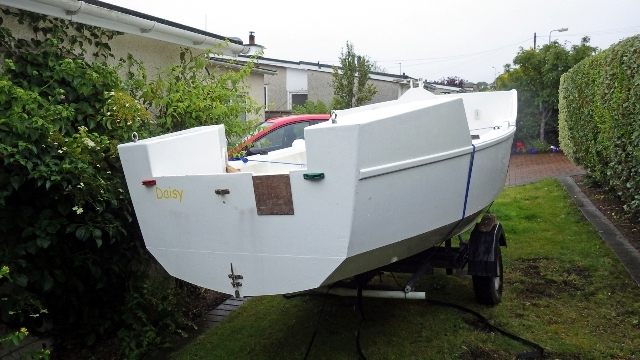 – Only genuine enquirers with a real desire for a good cruising dinghy and the cash to buy should respond. 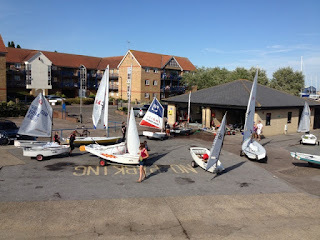 If you are not already a member of the DCA, you can discover how to join by visiting their website at http://dinghycruising.org.uk/ . A rare opportunity to buy a well-made example of this famous self-righting 14ft cruising dinghy designed by Eric Coleman, one of the founders of the DCA, and featured in his book Dinghies for All Waters. He took his inspiration from ballasted sail and oar lifeboats with raised buoyant ends, as seen elsewhere in this issue of Dinghy Cruising. Daisy was launched in Summer 2011, and has been sailed infrequently since. The builder worked from DCA plans supplied by Peter Bick, and she was some seven years in build. 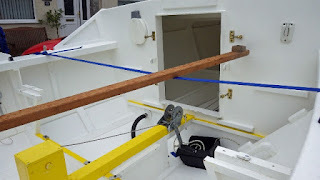 The hull was not made using the stitch and tape method but exactly as the original, with chine log / frame construction, which results in a very tough plywood boat. 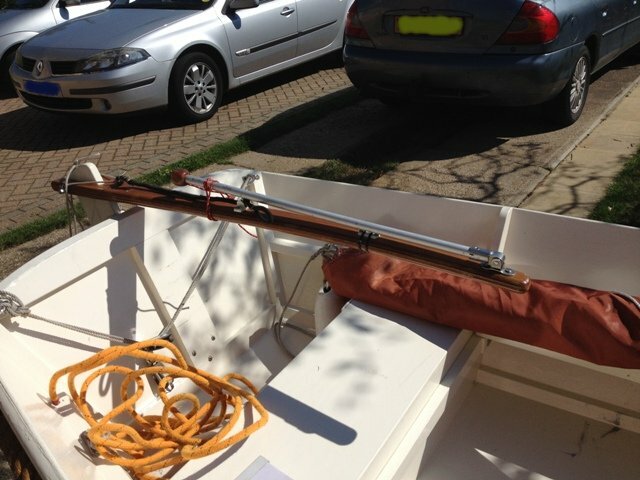 Note: the timber across the cockpit is to brace the cover – not a spar. It was raining heavily at times while I was photographing the boat, so these shots could have been a lot better. Non-slip floorboards go over the storage space above the cockpit sole, which is kept dry using a substantial bilge pump (left of main hatch). 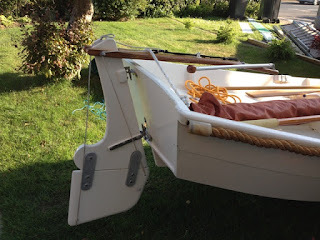 She is not Bermudan rigged, as designed, but has gunter spars in Douglas Fir. 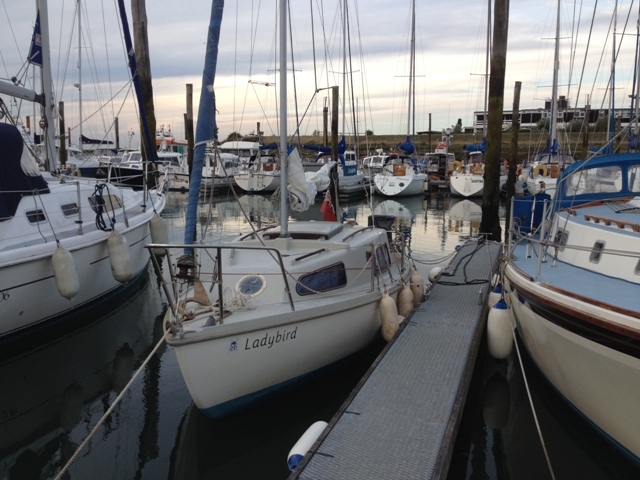 Back at home after a two day cruise aboard ‘Ladybird’, I’m ready for bed! 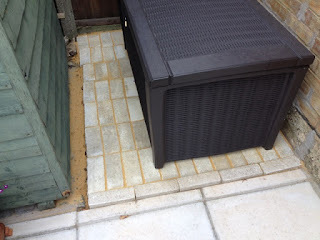 But here’s a taster photo. 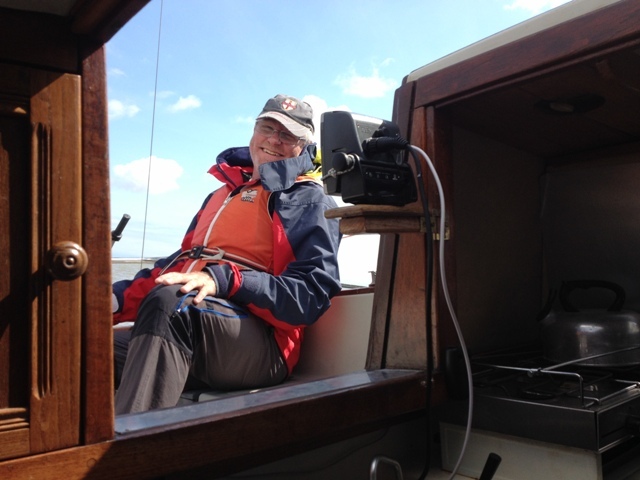 The owner and skipper at the helm looks pretty contented. Much activity preceded the planned family gathering, and on the morning of the great event it was no longer a jog, but a sprint to the finish before the arrival of our guests. The chief chef had been at work from the rising of the sun. 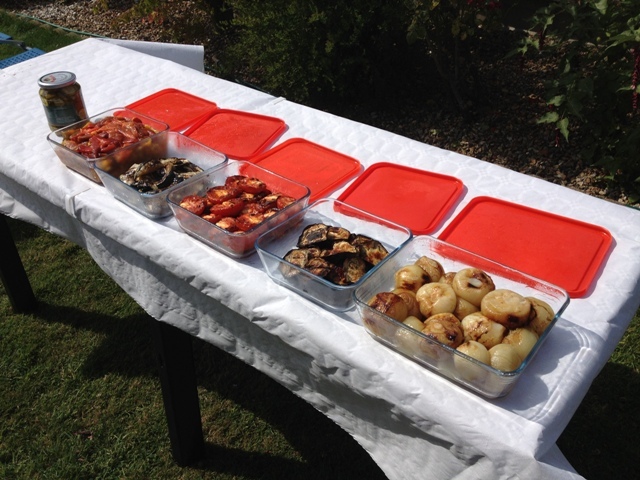 This expert, gourmet barbecue cook prepared and roasted veggies and meats in order and on time fit for a king’s luncheon with his nobles, ladies and gentlemen. 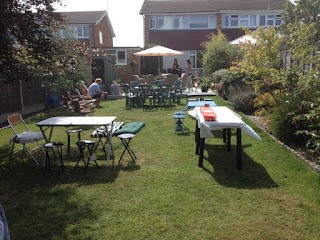 The weather was perfect and the event was a great success. 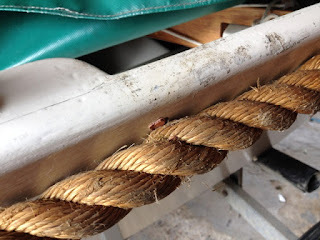 When coastal sailing I generally keep a working log, but if things become hectic for whatever reason, and my attention has to be on handling the boat, it becomes impossible to maintain a log. A parallel situation has arisen at home, because I have been incredibly active, so active that I’ve not been able to find time for writing the blog. There hasn’t exactly been extreme pressure for this, because many of my efforts have been voluntarily self-imposed. I’ve wanted to put lots of things straight for a long time, both large and small – jobs requiring attention that I’ve put off because of more pressing matters, or simply because I did not feel like tackling them. As the time approaches for a family get-together, so the pressure and demand has increased. With visitors already in the house, time has to be dovetailed into their schedule of activities. More visitors are arriving tomorrow. 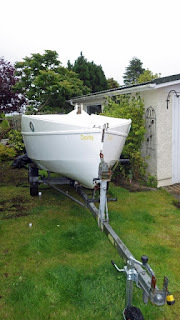 My next planned boating is for a couple of days away, possibly three, starting next Wednesday – more about that, after the event, if it goes ahead. Edmond de Rothschild, the first foiling MOD70, has shown her paces in sailing trials off Lorient . 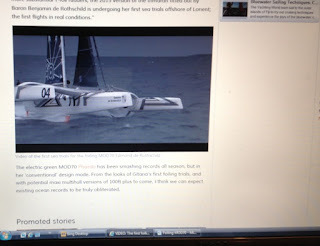 (See video link below*) The MOD70 class is a One Design 70ft ocean racing trimaran that can reach speeds of 40 knots plus. Who knows what speed a foiling MOD70 might achieve? This awesome flying machine makes my mind boggle. You would think she was completely symmetrical, but she has an ‘L’ – shaped foil to port and a ‘C’ – shaped one to starboard. 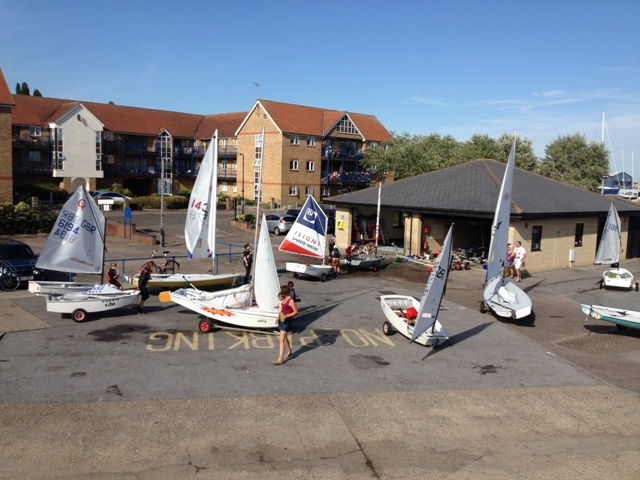 From what I saw as a spectator, the Otter Week organized by the Royal Corinthian Yacht Club made a great start today. Conditions couldn’t have been more perfect. Otter Week, this year runs from 9th to 14th August, and it is for youngsters between the ages of 6 and 18 years. There’s a very full programme of events, not just sailing, but activities that would excite and reward those taking part, such as bowling, fancy dress, and an inflatable event. On top of that there’s a roast hog meal, and an Izumi oriental meal. The kids will have a fantastic time.